Guess what day it is? You already know what day it is, you don’t need to guess. It’s time for Derpy’s Skymall, where wallets go to die! First up is an all too fitting Fluttershy doormat. I… don’t think I could use this. but it’s still absolutely adorable. All of the cute, right here. All of it. These custom fillies of the mane six are all for sale on ebay, each one currently at about $20 with a day left. Now this is pretty awesome. While I’m not the type to pay much attention to fursuits in general, you have to admire how much work (and fabric) goes into a well-made one. This Big Mac costume is at $157 on ebay, with a buy it now price of $1,200. Considering how well made it is, that’s a huge steal! Here’s one for the gamers: An Xbox 360 elite with a custom painting on Rainbow Dash on it. Now, I don’t really… game, but this thing is pretty sweet. It also comes with a Big Mac themed controller and five games! Bidding starts at $150, Buy it now price is set for $350. Oh my goodness, this little thing is so cute, and round, and adorable!!!! She’s currently at $47 on ebay with less than a day left! This is the first plushie I’ve seen of a doormat! She’s currently at $182 on ebay, and she sings! This Derpy plushie is not only adorable, but it’s also huge! She stands just under 2 feet tall, for maximum cuddling. And she’s currently at just £40.00 ($62 or so)! Why are laying down/sitting plushies always so cute??? This adorable Dash beanie plushie is currently at a mere $10 on ebay, with two days left! 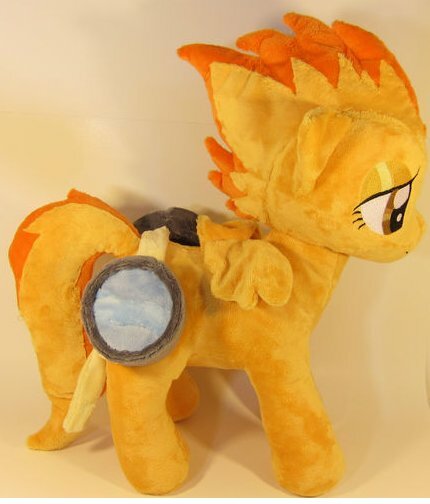 And finally, this lovely Spitfire plushie, on ebay for $202 currently! She comes with probably the most awesome goggles ever, too! Aaaaand, that’s it! I’ll see you all next week with another bath of fabulosity. As always, submit any and all awesome fanmade merchandise via the submit button. Ta-ta! ← Artist of the Week: Megasweet!